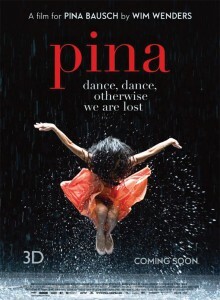 Went to see Wim Wenders extraordinary 3D dance film ‘Pina’ last night at the Sydney Opera House. It was the closing film of this year’s German Film Festival and Wenders flew in especially for a Q&A afterwards. He told us that he’d been trying to work out a way in which to bring the legendary Pina Bausch’s dance theatre to the screen for many years when he found himself at Cannes watching ‘U2 in 3D’. Finally, it seemed the technology had arrived and he could see a way in which to capture her unique style of movement. But no sooner had he begun to work on the project than the German choreographer died, leaving him and indeed Bausch’s entire company of dancers devastated. But with Pina’s mantra, “Dance, Dance. Otherwise we are lost” ringing in their ears, they plowed on and created a fitting tribute to her. Full of elegiac passion and sweeping history, ‘Pina’ is a film for buffies and culture vultures alike. I met Wenders at a function afterwards and he almost mistook me for my sister Emma who had worked as Assistant Director with him on his Australian odyssey ‘Until the End of the World’. I recalled the time when I saw Pina in the flesh dancing at her Festival in Wuppertal, a city that Wenders takes wonderful advantage of in the film, even placing the dancers up in the famous Schwebebahn (an elevated monorail built in 1901). I remember interviewing Pina’s Australian principal dancer Julie Shanahan, a woman who worked with her for 22 years, and whose sister was in the audience last night. She presents a striking figure in the film. Another of Pina’s Aussie leading ladies Meryl Tankard, while not in the film, was in the audience and was on standby to take to the stage should Wender’s plane be delayed. She was relieved that it wasn’t and thrilled to be able to honour her former choreographer vicariously through the film. Dance has officially been taken to another dimension.